What was the “I’m not a bad slime” reference? In episode 6 of That Time I Got Reincarnated as a Slime, Shizue notices that Rimuru is Japanese after he says “I’m not a bad Slime” which is apparently a reference from a game she heard about from a friend she had. We then discover that she got engulfed in flames during an air raid. Excuse me if I’m wrong, but this seems like an air raid from WW2 and I don’t think there were any games back then. Is she referring to a board game or party game, or have I just got my history mixed up? I’m curious as to what game she is referring to as well. Where did the idea of living slimes originally come from? Is she referring to a “tabletop RPG”? Where did that quote actually come from? What was the “I’m not a bad slime” reference? A web search got me results regarding a game called Dragon Quest. Apparently, friendly slimes in that game greet players with 'I'm not a bad slime!' This is most likely a reference to that game. In addition, I also found this, which says this is a reference to Dragon Quest. Regarding the air raids: From the link given by @AkiTanaka , a Japanese fan speculated that Shizue, who was summoned during the air raids in the 1940's, laughed not because she knew it was from a game or that she came from a time when the game already existed but because it reminded her of a friend, most likely summoned from a time where video games (especially Dragon Quest) already existed, who told her about this. Also, as @RossRidge said, the air raid was most likely the Bombing of Tokyo, which coincides with what is stated in Shizue's wiki page. It was a school for kids from other worlds. ... 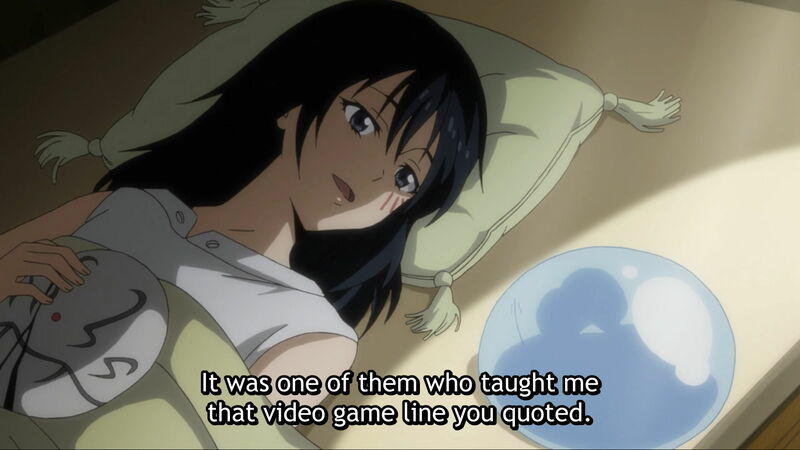 It was one of them that taught me that video game line you quoted. Not the answer you're looking for? Browse other questions tagged reincarnated-as-a-slime or ask your own question. What is Japanese version of the pun word, “slife”? … and term for adult friend? Reincarnated as a Slime — Are the alphabets in the end credits real? How did Rimuru get the human form? Why did the storm dragon's name change from Verudora to Veldora in the anime? What is the context for Rimuru's joke about taking five minutes for the audience to quiet down? Who was the attacker targeting in episode 1?